Is this what you want? he asked, and I said yes, so he took off his skin for me. He was beautiful, shining red organs and crisp bones. I stepped forward to embrace him. I felt his naked wet muscles against my arms. The start of the year is a good time to renew one’s vow to consume hot food with greater regularity, and while Sriracha is not the spiciest of what’s available by a stretch, its blend of flavor and heat fills a special niche (even if the factory’s neighbors do not appreciate its incense). Here is a video celebrating the craftsmanship behind this sauce, combining the wonders of large-scale manufacturing with an artisan’s quest for perfection (chili waterfall=true wonder). “I think Chili is a good ingredient to have in many parts of your life.” More artists should combine performance with the downing of habañero peppers, as the Danish National Chamber Orchestra does here. Ulysses III: I can’t say enough good things about Ulysses, which gets better and better all the time. Especially if you still write in Word, I feel sorry for you, and even if I don’t know you, because you’re a human being I love you too much to stand idly by while you waste your life unnecessarily. Learn markdown and come to love plain text! I write everything in Ulysses, which in turn keeps everything organized and backed up, and am close to finishing my first book written entirely within it and it’s unalloyed pleasure to work with it. Be happy and buy it at now for 50% off. Slugline: I haven’t used this much because, you know, I’m only just about to write that screenplay, but it’s a beautiful plain text app that uses the Fountain syntax for script formatting. Scrivener: I’ve tried to love this app that a lot of writers, mostly novel writers, use and love. Maybe you will succeed where I have failed. What it can do well is format, so even though I’d never use it for a writing environment I can see using it as a place to typeset a book for PDF export and printing, although I use Mellel for that. Acorn 4: The best light not-at-all-lightweight image editing app. Marked 2: This is not part of the creative app sale, but is on sale this week. If you write in plain text, you’ll need eventually to preview/export/print what you write in the font and format of your choice. Ulysses has a function like this built-in, but Marked 2 is a bit more feature-rich and will of course work with any other editor. Someone at Podio (?) 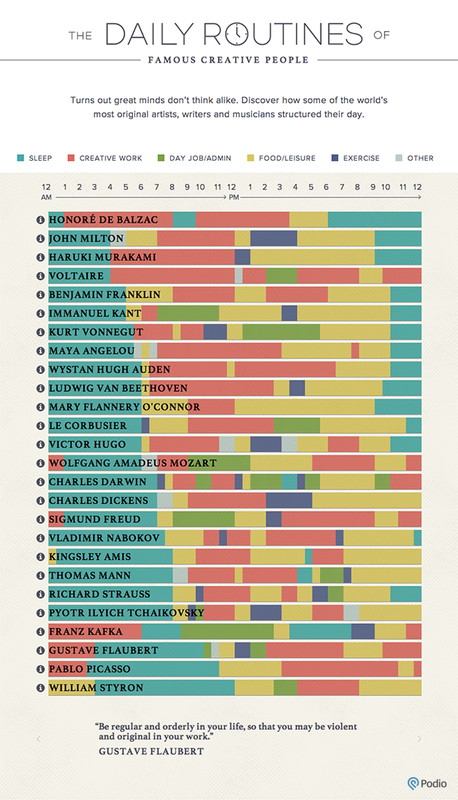 has compiled a lot of information about the habits of creative people into an interactive chart. Most of this info appears to come from Mason Currey’s exhaustive book and blog Daily Rituals (as well as a few other sources). Slate ran a serialized version of Currey’s work prior to the book’s publication, which is all quite good. 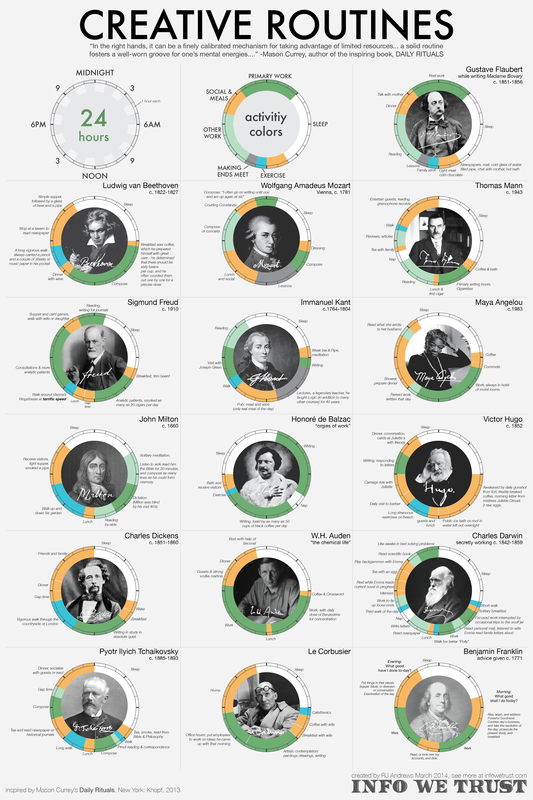 Given how much time I’ve spent reading and thinking about artists’ schedules and working habits, you might expect that I would have some insight into what makes for an ideal daily routine. Is there some combination of sleep, work, exercise, coffee, and focused head-scratching or brow-furrowing that is most likely to lead to creative breakthroughs? Or, at the very least, are there some basic guidelines that will stave off blocks and guarantee a minimum level of intellectual output? Short answer: no, not really. The one lesson of the book is that there is no one way—the rituals and habits that helped Artist A create a masterpiece would never work for Artist B; and, actually, they might not even work for Artist A for very long. One’s daily routine is a highly idiosyncratic collection of compromises, neuroses, and superstitions, built up through trial and error and subject to a variety of external conditions. Cliff Denton of Ernest Wright & Sons assembling scissors for what is apparently the last maker of hand-forged scissors on earth. What I’m talking about is the state of constant distraction we live in and how that affects the very special energies required for tackling a substantial work of fiction—for immersing oneself in it and then coming back and back to it on numerous occasions over what could be days, weeks, or months, each time picking up the threads of the story or stories, the patterning of internal reference, the positioning of the work within the context of other novels and indeed the larger world. I will go out on a limb with a prediction: the novel of elegant, highly distinct prose, of conceptual delicacy and syntactical complexity, will tend to divide itself up into shorter and shorter sections, offering more frequent pauses where we can take time out. Too many good things in this Paris Review interview with Adam Phillips to exhaustively excerpt (is that a thing? ), so just go and read it. Symptoms are forms of self-knowledge. When you think, I’m agoraphobic, I’m a shy person, whatever it may be, these are forms of self-knowledge. What psychoanalysis, at its best, does is cure you of your self-knowledge. And of your wish to know yourself in that coherent, narrative way. You can only recover your appetite, and appetites, if you can allow yourself to be unknown to yourself. Because the point of knowing oneself is to contain one’s anxieties about appetite. It’s only worth knowing about the things that make one’s life worth living, and whether there are in fact things that make it worth living. If one looked into digression, what would begin to fall apart very quickly would be the idea of nondigressive prose and conversation. It seems to me that digression may be the norm, the invisible norm, in conversation. Because if you believe in digression as something separate, you must believe it’s possible to be coherently focused and purposive. What psychoanalysis shows is that one is digressive whether or not one wants to be. Indeed, the digressions one is unaware of are the most telling. Even in normal conversation it’s very interesting how we pick up on each other’s digressions, not only in terms of content, but also in terms of tone of voice, so that it’s actually extremely difficult to stay on a subject. To stay on a subject you’ve got to know what the subject is. Relationships should make us feel better. Why else bother? But there are different ways of feeling better. And I don’t think the project is to make people feel better. Nor is it to make people feel worse. It’s not to make them feel anything. It’s simply to allow them to see what it is they do feel. And then what redescription might change. It’s done through conversation, but it’s also done through the medium of who the analyst happens to be. In other words, it’s not a replicable technique. In that sense it clearly isn’t scientific, because it’s something to do with what goes on between two people, mostly unconsciously. An analyst should be someone you have an appetite to talk to and who has a desire to listen to you. Not a professional desire, which is a contradiction in terms. Analysts are people who don’t speak on the patient’s behalf, don’t speak for someone, unlike parents and teachers and doctors and politicians. [I]f you live in a culture which is fascinated by the myth of the artist, and the idea that the vocational artistic life is one of the best lives available, then there’s always going to be a temptation for people who are suffering to believe that to become an artist would be the solution when, in fact, it may be more of the problem. There are a number of people whom you might think of as casualties of the myth of the artist. They really should have done something else. Of course some people get lucky and find that art works for them, but for so many people it doesn’t. I think that needs to be included in the picture. Often one hears or reads accounts in which people will say, Well, he may have treated his children, wives, friends terribly, but look at the novels, the poems, the paintings. I think it’s a terrible equation. Obviously one can’t choose to be, as it were, a good parent or a good artist, but if the art legitimates cruelty, I think the art is not worth having. People should be doing everything they can to be as kind as possible and to enjoy each other’s company. Any art, any anything, that helps us do that is worth having. But if it doesn’t, it isn’t. I’m away from home right now, ostensibly working on art, so I love and hate this.